The Whale on the Beachis a play about diversity and normality. It is always quite delicate to speak about normality, because on the one hand we do not know, and on the other, we know more than enough about what is normal, because the view on normality is defined by the society, government - and hence – ‘the authority’; whose judgments we have internalised and changed into prejudices, fears and even trauma. What is really normal, or who is the one who is normal? The Whale on the Beachtells us spontaneously that we should be able to requestion our criteria on what or who is normal. We should not be satisfied with the obvious, preconceived, reckless judgements, but rather put them to the test that works hardest for us whenever we are actively involved in it. And we need to be able to implant our doubt into this 'obvious', 'preconceived' and 'reckless' to such an extent that it would help us – and above all the young viewers – to judge and survive. The Whale on the Beach is also a play that tells us how important it is to look at the world, the life around us, other people, parents, teachers, classmates, friends, family and ourselves with different eyes. And this should be even an imperative, namely: How can I look differently at what seems so familiar? What does it tell me, just for the sake of it, without any obvious benefits? 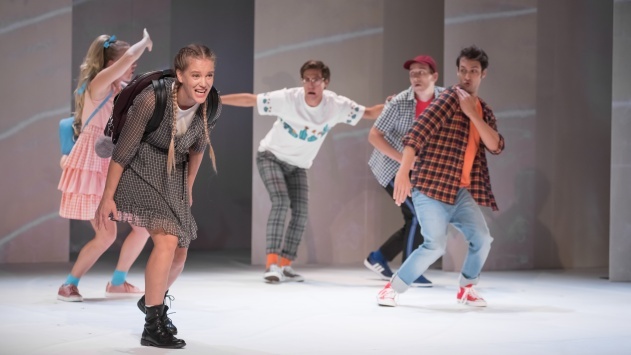 This play is also, to some extent, quite critical towards the role of the family, its modern image, the lack of connectedness within it, and towards its techniques of evasion and filling of original gaps. What it questions is how to include into the world what has been excluded from it, because it is different, how to face the diversity outside the frames, determined by prejudices, environment, authority, how to communicate or understand each other outside the set patterns, empty phrases or imposed dictates … The Whale on the Beach is thus a play that conveys to us most naturally, yet in an engaging manner, unobtrusively, yet clearly, uninstructively, but rather through a power of play, an essential truth: the truth about the diversity. Vinko Möderndorfer, both stage director and author of the novel, received the Desetnica (The Tenth Daughter) Award for the best children's or youth literature, awarded by the Slovene Writer's Association. His novel was also chosen for the annual »Growing with a Book« project and thus reached an enviable number of 22.000 primary school pupils. Many schools have also included it in their »Reading Badge« activities.